The Klang District is a district in Selangor, Malaysia. It is located in the western part of Selangor. It borders the Kuala Selangor District to the north, Petaling to the east, Kuala Langat district to the south and Malacca Straits to the west. The district was further divided into two mukims which is Klang and Kapar that covers 626.78 square km of land with 53.75 km of coastline. The district's principal town is Klang City. Other towns in the district include Port Klang , Pandamaran, Kapar and Meru and Bandar Sultan Sulaiman. The Klang River flows through the Klang district and end near Port Klang and it has many islands such as Klang, Indah, Chet Mat Zin, Crab, Tengah, Rusa, Selat Kering and Pintu Gedong Island. 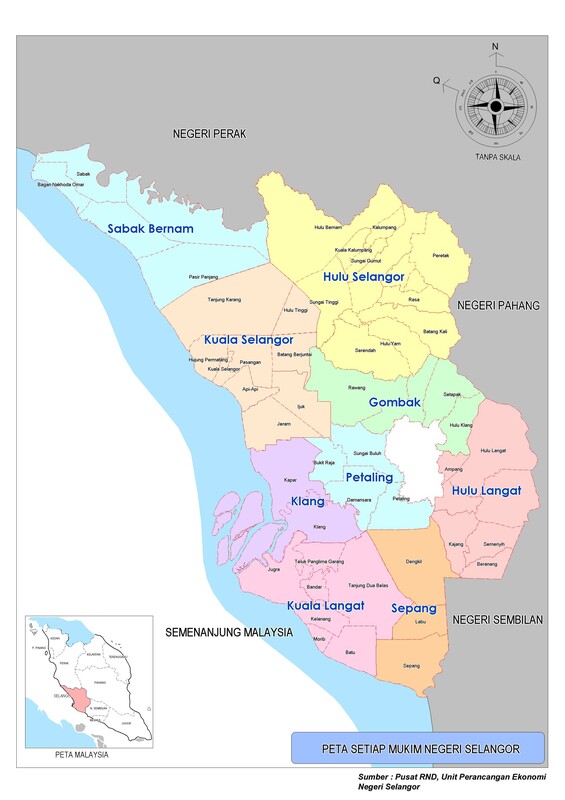 Klang District is divided into 2 mukims, which are Kapar and Klang: Kapar is the areas north of Klang River (Kapar itself is also the name of a town), while Klang covers the area south of the river. Klang city itself includes areas both north and south of the river. In 1980, the census figures for the 3 main ethnic groups in the Klang District were: Malays 105,195, Chinese 119,186, and Indians 54,159. The following are the 2010 census figures for Klang District, which include the city of Klang, Port Klang and part of Shah Alam. Wikimedia Commons has media related to Klang. ^ "Portal Rasmi PDT Klang Perutusan Pegawai Daerah Klang". www2.selangor.gov.my. ^ "Portal Rasmi PDT Klang Orang Besar Daerah Klang". www2.selangor.gov.my. ^ a b c "BACKGROUND". luas.gov.my. ^ "Official Website of the Hulu Selangor District Council". Retrieved 14 October 2013. ^ "Persempadanan Mukim". Pejabat Daerah / Tanah Klang. ^ "Peta Mukim Negeri Selangor". Retrieved 31 August 2016. ^ "Soil Maps of the World - Peninsular Malaysia". Retrieved 31 August 2016. ^ Katiman Rostam. "Population Change of the Klang-Langat Extended Metropolitan Region, Maalaysia, 1957-2000" (PDF). Akademika. 79 (1): 1–18.